Tornillo sujetadores bei Is the Specification Pattern obsolete? Anonymous bei Is the Specification Pattern obsolete? During the last weeks I got some insights on ASP.NET MVC 2. Personally I like the programming model of MVC in contrast to WebForms, although the productivity first seems to be lower in common data-driven scenarios. One of the most advertised features of MVC 2 is the support of Data Annotations for adding validators and further information right to your model via attributes. Data Annotations have their origins in ASP.NET Dynamic Data and are defined in the System.ComponentModel.DataAnnotations namespace that ships with .NET 4.0. Microsoft is promoting Data Annotations even further and beside MVC and Dynamic Data they can be used in Silverlight, too. Now you could think that everything’s fine with this solution, right? But that’s not the case! Data Annotations have an important and not very obvious shortcoming which can lead to serious data consistency problems. The problem: Data Annotations are checked during the model binding phase based on the posted form values and not on the bound model entity. That means only the Data Annotations on the posted form values are checked, but not other properties which are perhaps defined on the model class, but missing in the form values. Imagine for example some bad guy who visits your page and edits a Product. Before posting the form he manipulates the DOM of the page and removes some form values. 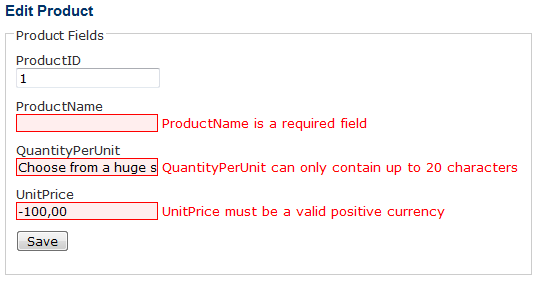 Those values will not be checked on server-side and thus the (invalid) Product will be saved to the DB or some operations will be done on it. Got the point? This attribute takes all validation attributes into account which are defined on the model class itself or on an associated metadata class. The attribute adds all validation errors to the ModelState dictionary of the controller which have not been added before and which are defined in the ErrorMessage or the Error Resource of the validation attribute. Note that your controller has to derive from the Controller class and not from ControllerBase, but that’s the default setting and should not be a problem. In this article, I want to give you some information about my experiences with the Beta-version of ASP.NET MVC. During December, I had the chance to build up an application for the administration of media elements with ASP.NET MVC and thus I got a good insight in various topics. ASP.NET MVC is Microsoft’s interpretation of the well-known MVC architectural pattern, bringing MVC to the ASP.NET world. It is MVC for the presentation layer, not for the whole application (that should be true for most applications). Furthermore, it is not a top part of classic ASP.NET, but it’s a completely new approach for designing/creating web applications. This implies many changes and makes ASP.NET MVC very different from classic ASP.NET in many ways. The MVC pattern follows a strict separation of concerns principle. The Model should include the business logic and is being invoked through the Controller, which is responsible for retrieving data, choosing and calling Views with that data and handling user requests. Views include only view logic and are creating/formatting the output for a user. ASP.NET MVC tries to overcome the disadvantages of web-forms based programming by ASP.NET. Those come mainly through the purpose of ASP.NET to make web application development feel similar to win-forms based development and thus to make the access for Windows application developers more fluent. That’s a good intent, but it brings many problems to life, because we are not in a stateful Windows application, but in a stateless web environment. While classic ASP.NET developers try hard to get a good separation of concerns to work, logic is often put too much in code behind. Furthermore, ASP.NET tries to emulate stateful behavior through saving a client-based ViewState as hidden field, which can become really big and can waste page sizes. Other problems include difficult Ajax handling, missing full control over page rendering (especially when you use web-forms) and a complex page lifecycle, which is difficult to understand and to use sometimes. I’m thinking of ASP.NET MVC as kind of „back to the roots“. For many things you have to do more handwork, where ASP.NET gives you more comfort respectively didn’t require deep knowledge of web technologies and protocols. The intent is to give you full control of the HTML markup, but it implies that you create this markup at your own. Basically, you don’t have most of the well-known ASP.NET controls. Repeater control in ASP.NET? It’s named „foreach loop“ in ASP.NET MVC 😉 . GridView in ASP.NET? Use a foreach and a HTML table in ASP.NET MVC. That sounds cruel for most developers I spoke with about this topic. In fact it’s not the whole truth. There are some so-called „helper objects“ exposed in the views, which encapsulate basic (e.g. HTML) functionality and can be used instead of the real markup. Everyone can build up his own helper methods by using standard C# extension methods and thus extend their functionality for his own needs. Currently the helper methods cover mainly basic HTML functionality like list boxes, check boxes, buttons, forms etc.. Advanced controls are missing (yet), but it’s only a matter of time when others will provide them. The community project MvcContrib has done first steps in this direction and provides a Grid control, for instance. It’s not perfect, but it’s pretty nice code and shows up how controls can look in ASP.NET MVC. The fact why you can’t use most of the classic ASP.NET controls is that you don’t have ViewState and postbacks anymore. This implies that you can’t use any controls that rely on those principles. It forbids to use event based programming as well. Thus if you want to post form values back to the server, you have to create an HTML form and a controller action which can handle the POST verb. Thankfully there is a nice data binding concept, that gives you some support on dealing with this. If you want some kind of dynamic loading as can be done by event-based programming, use Ajax for that. ASP.NET MVC is introducing many new concepts as well: URL routing, TempData/ViewData, Helper objects, data binding, validation, … these are only some topics which you have to understand, if you are starting with ASP.NET MVC. Beside those heavy changes and differences there are similarities to ASP.NET, too. Thus you are able to use the standard ASPX markup, which is available as standard view engine in ASP.NET MVC. Anyway, you can use most core ASP.NET features like authentication, role handling, Session, Caching etc.. This is a not just a different tune, but a whole different band playing all new music. Not everyone will like the music, and that’s why the world has more than one band. This is a Good Thing. I like to think of ASP.NET MVC as the raw, acoustic version of the more heavily produced and multi-layered ASP.NET WebForms we use today. And to avoid misunderstandings: ASP.NET MVC isn’t there to replace standard ASP.NET. Instead it makes an alternative programming model and both technologies will be developed further by Microsoft in the future. To choose either ASP.NET or ASP.NET MVC depends on what you want to do. Nick Berardi developed a nice decision table which guides you on your choice. full control over your markup, clean and tiny HTML pages. get a fast entrance to web application development. Personally I like the development in ASP.NET MVC. It gives me more freedom than classic ASP.NET and I feel more home in there. ASP.NET MVC is in my opinion a step in the right direction. The loosely coupled components give you the flexibility to exchange or extend parts of the framework as well as to fake things out and test parts of your code separately. A main point that Microsoft has done right is to include the community in the development process and to consider their needs. The open source community project MVCContrib shows this direction of actively including the community. Furthermore, ASP.NET MVC comes with jQuery, built-in jQuery support and jQuery intellisense. Microsoft promises to support jQuery and to contribute improvements back into the jQuery development in the future. That’s a huge turnaround for Microsoft, which was fighting Open Source heavily not long ago. I think, other development teams at Microsoft should follow this example. For instance, the ADO.NET team has created so much distrust while developing the Entity Framework at its current state and it’s not much caring about community needs. Guys, time to re-think! On the other hand, there are many things for you to dislike ASP.NET MVC. Through the lower level of abstraction and the missing ASP.NET controls you could miss some kind of comfort while creating your web applications. Furthermore, there is no direct „upgrade path“ for learning ASP.NET MVC if you have developed ASP.NET so far. For beginners in web-based application development, there is a very steep learning curve, because you have to be aware of the stateless programming model and basic technologies like HTML, CSS, HTTP and so on. In part, you can look at v1 of ASP.NET MVC as a Framework for building ASP.NET MVC Frameworks. That’s a thing which I can truly sign. And it’s leading the future development. In my opinion there will come developers and build up their own frameworks on top of ASP.NET MVC, making them more narrow and including their own principles. And ASP.NET MVC allows them to do this. Moreover, that is why the ASP.NET MVC developers didn’t make their framework very opinionated. At every point there are many degrees of freedom and some people are frustrated about that, because it allows everyone to create bad code. But it’s a good thing, if others come and make their frameworks on top of ASP.NET MVC really opinionated. It’s easing the way for those people and thus I’m applauding the ASP.NET MVC team. I’m really happy to see this bare framework to come out and I’m interested to see what will have been developed in spproximately one year. For now, I’m really confident of that. Just a short announcement: as ScottGu stated in December last year, the Release Candidate of ASP.NET MVC has been released now and can be downloaded from here. In the RC, the major bugs have been fixed and many little improvements have found their way to the package. All changes can be viewed in the release notes. V1 of ASP.NET MVC is planned for February 2009, so stay tuned. 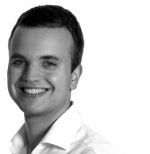 ASP.NET MVC Tip: Got an Ajax Request? Currently I’m becoming inspired by the Ajax Helpers, which ship with ASP.NET MVC. With Ajax.BeginForm(), Ajax.ActionLink() and Ajax.RouteLink() there currently (ASP.NET MVC Beta 1) exist three extension methods, which one can use after integrating the Microsoft Ajax script libraries in his page and which provide basic Ajax functionality. At the moment I’m using Ajax.ActionLink() in my project to reload parts of my page, if the user clicks on a link. Especially I’m reloading data asynchronously, which the user changed through his click. That’s working pretty perfect for me, additionally I can serve a Confirm-Message via the AjaxOption „Confirm„, which is presented to the user before executing an action and over which the user can canel an action, too. There’s one problem for me in this case: with the ActionLink ASP.NET MVC calls an Controller-Action. That’s happening via a special URL, which is mapped by the ASP.NET MVC routing system to an action. This action delivers with PartialView() the data (View), which are injected in the existing page with the aid of Ajax. The problem is: the user can pass this URL directly in his browser too and then he gets only those partial data in response, but not the whole page as in the case when he’s using the Ajax-ActionLink. MVC is all about proper separation of concerns. There’s one line of code in the sample that I think is violating that, and that’s the IsAjaxRequest property. This all smacks of someone attempting to make the MVC framework feel more like the old Postback world and quite frankly, the old postback world can eat my shorts. The controller, IMHO, is just a controller. It should not ever have to determine if it is rendering Ajax or rendering Regular. Ajax or regular HTML is a view decision not a controller decision. The job of the controller is to fetch the appropriate data required for rendering a view, and then pick the view to render. Now which way is prettier? Architecturally I like the second variant with regard to the separation of concerns principle which lets the controller do the stuff it should do. But there is one unaesthetic point in my eyes: the Ajax ActionLink is referencing to the action „MyActionAjax()“ and this link is delivered to the user by his browser. The user could be confused when he wants to share this link with one of his friends and has no direct access to the controller action, which stands behind this url. Thus from a user’s point of view the first solution makes more sense, but there has to be a trade-off as the case arises and I’m agog about your thoughts. Veröffentlicht am 2008/12/03 2010/07/10 Kategorien ASP.NET MVCTags Action Attribut, AJAX, Ajax Helper, Ajax Request, ASP.NET MVC, ASP.NET MVC Beta 12 Kommentare zu ASP.NET MVC Tip: Got an Ajax Request?